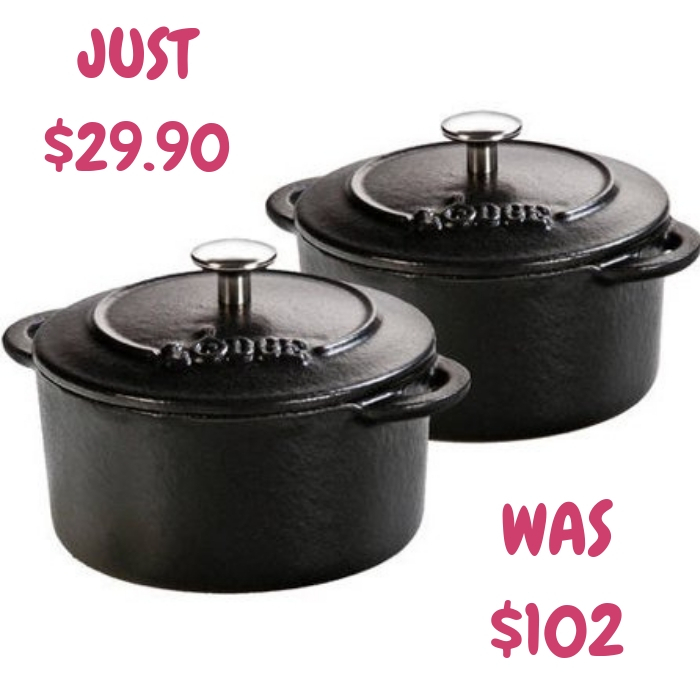 Lodge Cocottes 2-Piece Set Just $29.90! Down From $102! Score this Lodge 10-oz Cocottes 2-Piece Set which is on sale at Walmart for just $29.90 down from $102 PLUS FREE store pick up or FREE shipping for orders $35 or more! 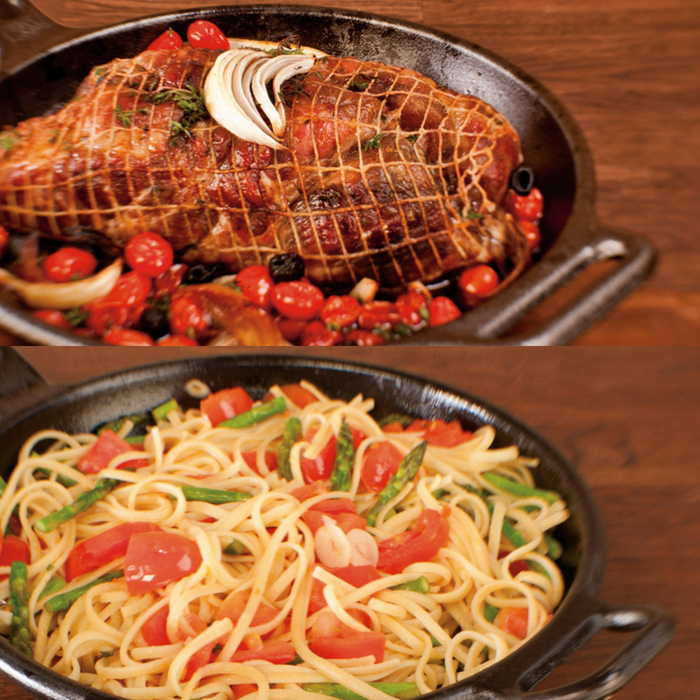 Creating cookware since 1896, Lodge has a rich history of an unparalleled dedication to quality and technology. The Lodge Enameled Cast Iron 10 Ounce Matte Black Round Cocottes are the perfect vessels for cooking individual servings of a pot pie, soup, appetizer or dessert and to use for oven to table service. The Enameled Cast Iron 10 Ounce Matte Black Round Cocottes conducts heat evenly and ensures that foods stay warm until they’re served. It’s also great for storing sea salts, sugar, flour, and/ or many other spices. The Lodge Enameled Cast Iron 10 Ounce Matte Black Round Cocottes has a vibrant enamel surface is resistant to acidic and alkaline foods and can be used to marinate and refrigerate without reacting to the cookware. This Lodge Enameled Cast Iron 10 Ounce Matte Black Round Cocotte is right at home on induction, ceramic, electric and gas cooktops, even in your oven up to 500 degrees Fahrenheit. 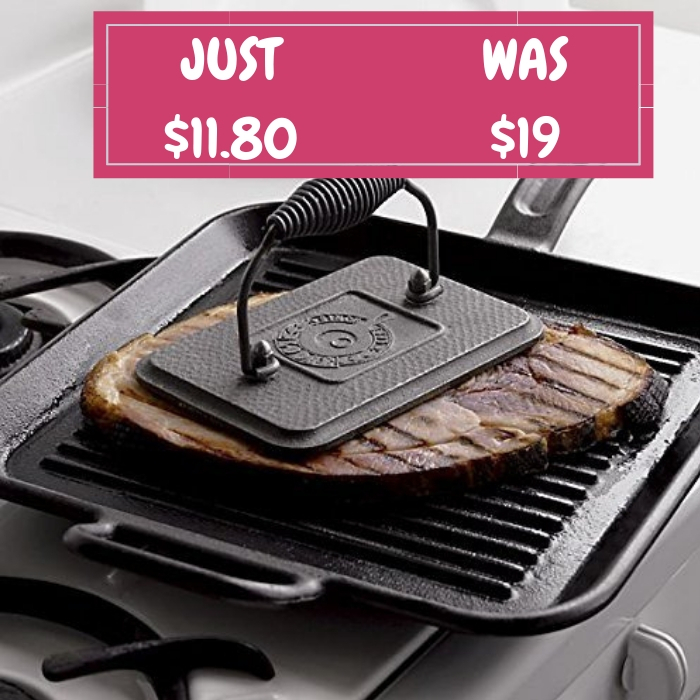 Lodge Grill Press Just $11.80! Down From $19! Head over to Walmart to score this Lodge Cast Iron Grill Press for just $11.80 down from $19 PLUS FREE store pick up or FREE shipping for orders $35 or more! The Lodge Cast Iron Grill Press 6.75-inch x 4.5-inch is ideal for searing bread or meat to enhance the flavor while grilling, baking or roasting food. It works great as a grill press for steaks and chicken too. Once heated up, this Lodge 6.75-inch x 4.5-inch cast iron grill press works in conjunction with a skillet grill to produce top and bottom searing simultaneously. It is conditioned at a foundry for a natural, easy-release surface that actually improves with each use. Conveniently Foundry-seasoned, this handy 6.75-inch x 4.5-inch grill press is designed for great heat retention, distribution and offers exceptional performance. Lodge Loaf Pan Just $12.29! Down From $38! 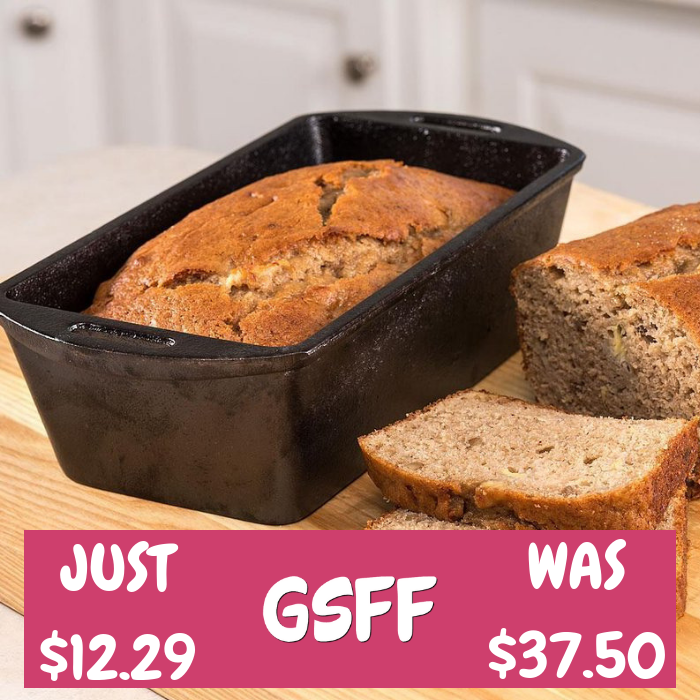 At Walmart, you can score this Lodge Loaf Pan for just $12.29 down from $37.50 PLUS FREE store pick up or FREE shipping for orders $35 or more! The Lodge Cast Iron 10-1/4 x 5-1/8 Loaf Pan, like any piece of Lodge Cast Iron, is a great heat conductor and is used for warming butter, melting cheese, scalding milk, or heating syrup and it moves with ease from the stovetop to the grill. This Lodge Cast Iron 10-1/4 x 5-1/8 Loaf Pan is a Cooks delight and they find it ideal as a serving pan as well. This Lodge Cast Iron Loaf Pan is easy to care for and durable enough to last for years. While the cookware comes pre-seasoned to prevent food from sticking, it works best when sprayed or lightly coated with vegetable oil before use. This Foundry-seasoning allows for a natural, easy-release surface that actually improves with each use. After cooking, clean with a Lodge stiff nylon brush and hot water. Using soap is not recommended, and harsh detergents should never be used. Towel dry immediately and apply a light coating of oil to the Cast Iron Loaf Pan while it is still warm. Lodge 6-Qt. Dutch Oven Just $59.90! Down From $115! Shipped! Head over to Walmart to score this Lodge 6-Quart Dutch Oven for just $59.90 down from $115 PLUS FREE shipping! The porcelain surface eliminates the need to season the cast iron and the smooth surface will not react to ingredients. 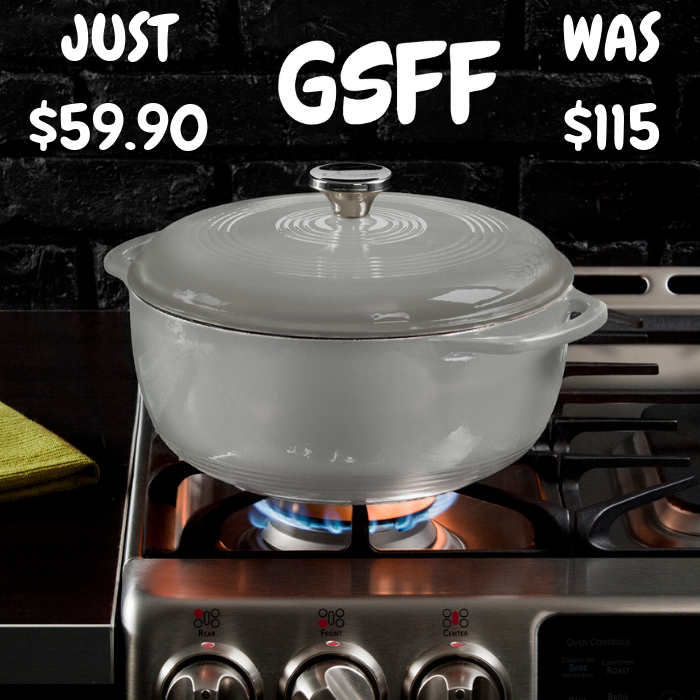 This stylish, Enameled Cast Iron Dutch oven can feature as a show piece of cookware in your gourmet kitchen. Whatever the function, this little powerhouse can handle it! An amazing compliment to any season, impress your guests with sumptuous soups and stews or delicious, buttery cobblers. This Lodge Enameled Cast Iron Dutch Oven is the perfect addition to your collection allows you to marinate, refrigerate, cook and serve. Choose the Lodge Enameled Cast Iron 6 Quart Dutch Oven in Assorted Colors next time you broil, braise, bake or roast in the oven. You can also use it to saut, simmer or fry on any stovetop. Don’t miss this awesome deal! 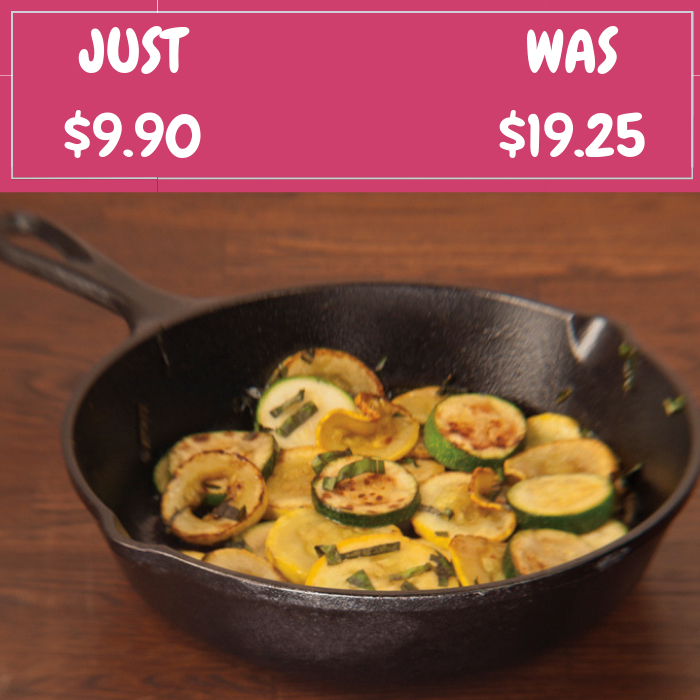 Lodge 10.25” Skillet Just $14.90! Down From $27! Walmart is currently offering this Lodge 10.25″ Cast Iron Skillet for just $14.90 down from $26.75 PLUS FREE store pick up or FREE shipping for orders $35 or more! 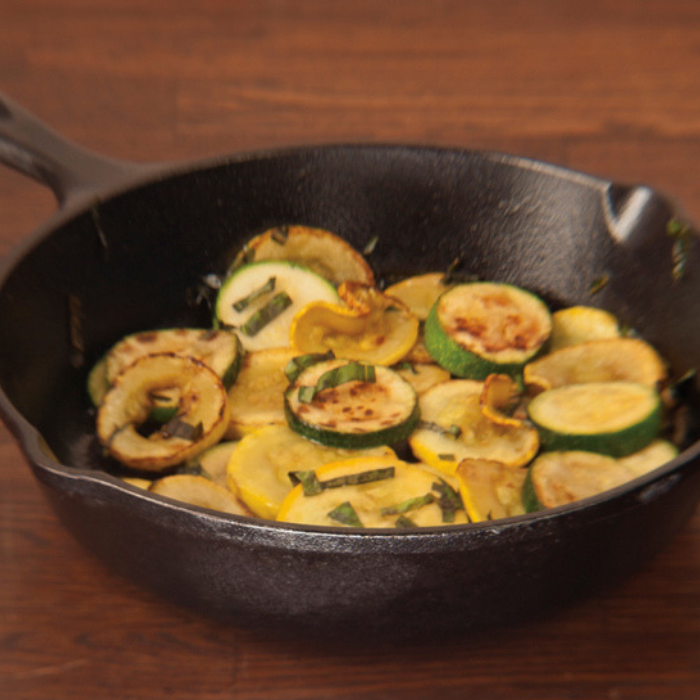 This skillet is completely versatile and will go from the kitchen to the campfire with ease. The 10-1/4″ Skillet ” Lodge Logic Cast Iron Seasoned Skillet will last for decades and continue to provide excellent performance year after year. Foundry-seasoned for a natural, easy-release surface that improves with each use. This must have kitchen tool is the perfect choice for searing, sauteing, simmering, braising, baking, roasting and frying. Great for use at home on the stove, out on the grill, or over the campfire. This Lodge Logic 10.25 Inch Cast Iron Seasoned Skillet is unparalleled in heat retention and even heating. 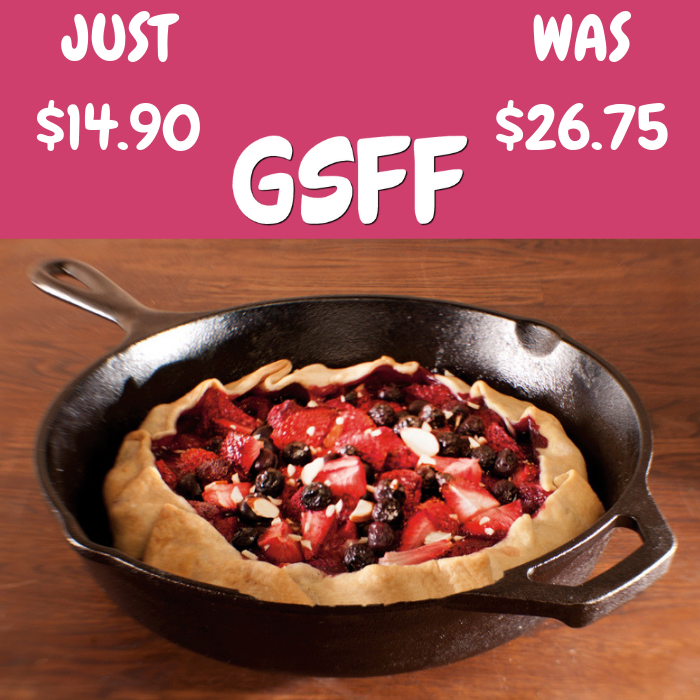 Lodge 8″ Cast Iron Skillet Just $9.90! Down From $19! Walmart is currently offering this Lodge 8″ Cast Iron Skillet for just $9.90 down from $19.25 PLUS FREE store pick up or FREE shipping for orders $35 or more! Lodge 12” Cast Iron Pan Just $17.07! Down From $40! At Walmart, you can score this Lodge 12″ Cast Iron Pan for just $17.07 down from $39.50 PLUS FREE store pick up or FREE shipping for orders $35 or more! Lodge Dual Handle Cast Iron Skillet is electrostatically coated with a proprietary vegetable oil and cured at high temperatures to allow the oil to deeply penetrate the surface of the cast-iron. Saute, sear, fry, bake, and stir fry. Use on all cooking surfaces, grills, and campfires. 2 loop-style handles for easy transport from stove top to oven to table. Hand wash and dry immediately – rub with a light coat of vegetable oil after every wash. Oven safe. The Lodge Seasoned Cast Iron 12 Dual Handle Pan is a multi-functional cookware that works wonders with slow-cooking recipes and all your favorite foods. Fry up a mess of catfish, roast a chicken, or bake an apple crisp in this generous 12 Inch pan that features two handles for heavy lifting and two subtle side lips for pouring. Lodge Logic 9″ Cast Iron Skillet Just $12.90! Down From $51! Walmart is currently offering this Lodge Logic 9″ Cast Iron Skillet for just $12.90 down from $51 PLUS FREE store pick up or FREE shipping for orders $35 or more! The Lodge Cast Iron 9-inch Skillet is a multi-functional cookware that works wonders with slow-cooking recipes and all your favorite foods. Fry up a mess of catfish, roast a chicken, or bake an apple crisp in this generous 9-inch pan that features two handles for heavy lifting and two subtle side lips for pouring. 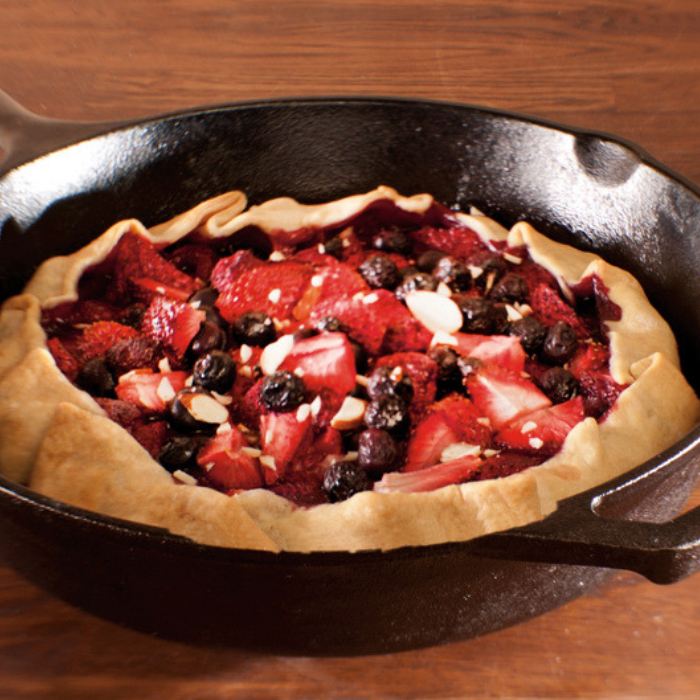 Cast iron loves a campfire, a stovetop, or an oven, and can slow-cook foods without scorching. It retains heat well so you can sear meat at higher temperatures and will keep your delicious meals warm for a long time. Whether used in a kitchen or camp, theses virtually indestructible cookware should last for generations. Lodge 10″ Cast Iron Skillet Just $11.99! Down From $23! Head over to Walmart where you can get this Lodge 10″ Cast Iron Pro Skillet for just $11.99 down from $23.39 PLUS FREE store pick up or FREE shipping for orders $35 or more! The Lodge 10 Inch Cast Iron Pro Skillet features a modern design with updated handles and sloped sides, for easy handling over heat. It is a welcomed addition to any kitchen. 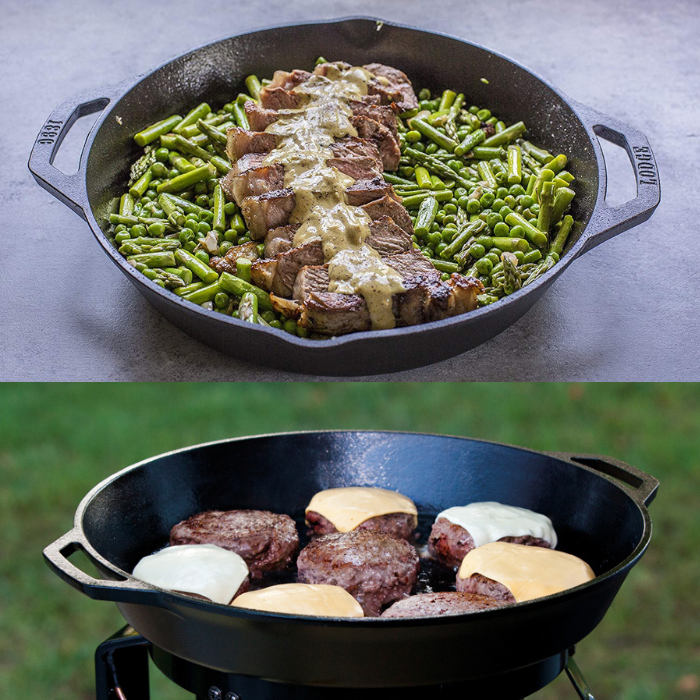 The versatile nature of the Lodge cast iron skillet means it can be used in the oven, on the stove, on the grill or even over a campfire. Its design offers easy handling during cooking, and it is already seasoned for a natural, non-stick finish that will improve over the time you own it. It promotes health by adding iron to your food. This 10 Inch skillet is unparalleled in its heat retention and will evenly cook all your favorite comfort foods. Use it to sear meat, bake corn bread, broil fish, bake deep dish pizza or grill chicken. This skillet makes an exciting gift for any cook. The Lodge 10 Inch Cast Iron Pro Skillet will bring many years of durability and cooking enjoyment to its owner.